A Tree is a common plant found on most biomes. 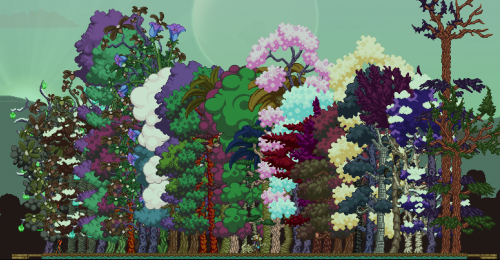 They are procedurally generated, meaning that the appearance of their bark and foliage is selected from a range of possible sprites. Despite their wide range of appearances, most trees function essentially the same. When cut with the Matter Manipulator or any other appropriate Tool, a tree will leave behind several units of Wooden Log from which the player may craft a variety of objects and items. The majority of trees also drop Saplings which can be planted in dirt to grow new trees. Each Sapling takes the appearance of the tree it grows into, allowing saplings from different trees to be easily differentiated. Not all trees will drop saplings. Some trees will only drop one sapling and some can drop many. A sapling will always grow into the same styled trunk and leaf tree as the tree that originally dropped the sapling. When a tree is examined the composite parts will form a description that can be used as a name. The name will be in the format "Trunk Type with Leaf Type". In addition to these blocks, saplings can also be placed on some blocks which do not appear normally but can be spawned in with admin commands. These are some of the basic types of trunk or bark. They come in a variety of colors and many have 'snow' versions. These are the parts of the tree which drop the main harvest material of the tree, usually Wooden Logs. These are some of the basic types of leaves or foliage. They come in a variety of colors and many have 'snow' versions. These are the parts of the tree which drop saplings, so a tree without leaves will usually not drop any saplings. Some trees only appear in unique combinations. fleshstem with fleshfoliage Flesh Drops Flesh Strands. Does not drop seeds. coconut with cocopalm Ocean Drops Coconuts and Wooden Logs. purewhite with purewhitey Prism Drops Wooden Logs. Does not drop seeds. magictree Spring Drops wood and Plant Fibre. Does not drop seeds. steamspring with steamspring Steamspring Drops Copper Gear Blocks. Does not drop seeds. toxiccoral with aridblank Toxic Drops Plant Fibre and Toxic Waste. Does not drop seeds. icespherestem Tundra Drops Wooden Logs. Does not drop saplings. This page was last modified on 26 June 2017, at 17:57.